Colorforms on shelf now combine the beloved storytelling play pattern and elements important to mom such as storage and portability with fun features and formats. New product and exciting formats to come for Spring and Fall 2016 include Record a Story, Figure Fun Playset and Dress Up Sets. Colorforms are based on the hottest licensed kids brands of today. New for 2016: Finding Dory, Secret Life of Pets, Little Charmers, Peppa Pig and more. 2016 marks Colorforms 65th anniversary, with over one billion sets sold through the years. Colorforms vinyl stick-on playsets are one of the best-known toy brands. They provide safe, creative, open-ended and imaginative play, and have been trusted by generations of parents and grandparents. Time Magazine named Colorforms as one of the 100 Greatest Toys of All-Time. Colorforms began with basic shapes of squares, triangles and circles, and has evolved, incorporating relevant licensed characters and other innovations that engage kids in storytelling. I remember playing with Colorforms as a child. They were so much fun. What began as basic shapes of squares, triangles and circles, has evolved to incorporate relevant licensed characters and other innovations that engage kids and encourage storytelling. Colorforms was one of the first plastic-based creative toys, and one of the first toys ever advertised on television. You could make a scene, move the pieces around and create something totally different. They provided hours of entertainment and creativity! Before there was super cool on the go assortments, we would put our pieces in baggies and play with them in the car! Now there are on the go travel kits that allow kids to have fun while in the car, on a plane or where ever, without making a huge mess. We got the Despicable Me travel set. The re-usable Despicable Me stick-on set provides hours of creative and imaginative play, and then folds easily away. Self-contained Despicable Me pack includes 2 colorful play scenes and 24 reusable Colorforms character stick-ons. 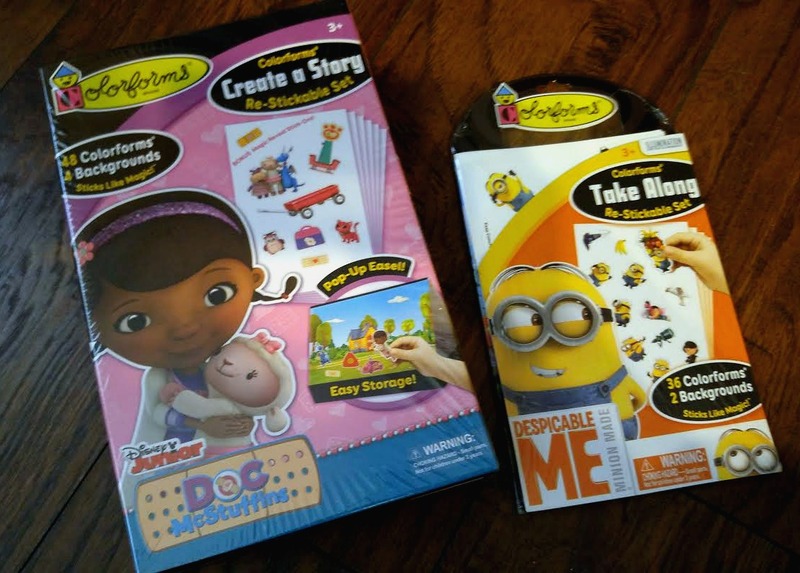 The classic Colorforms Disney Doc McStuffins Create A Story box set is back, with added value! Disney Doc McStuffins playset features a pop-up display easel, so you can flip through 4 backgrounds and apply 48 reusable Colorforms stick-ons to inspire endless story possibilities. When you are done, everything folds easily away in self-contained storage box! There are so many popular and beloved character sets available, there is surely the perfect set for your little out there! Licenses Include: TMNT, Paw Patrol, SpongeBob, Despicable Me, Cars, Frozen, Disney Princess, Doc McStuffins, Guardians of the Galaxy, The Avengers, Spiderman, and New for 2016: Finding Dory, Secret Life of Pets, Peppa Pig and Little Charmers. Licenses Include: Avengers, Doc McStuffins, Frozen, Princess, Mickey, Spiderman, TMNT, Paw Patrol, Despicable Me, Curious George, Daniel Tiger’s Neighborhood, Pete the Cat, Peter Rabbit and New for 2016: Finding Dory, The Secret Life of Pets, Peppa Pig and Little Charmers. Peppa Pig and Little Charmers.